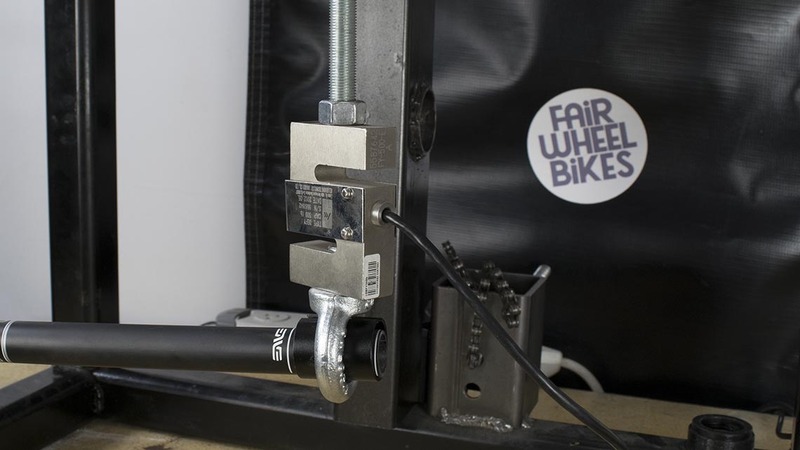 In the past year we’ve done deflection testing on road cranks, stems and road handlebars. Now it’s time to introduce the Mtb handlebar testing. For this first round of testing we’ve tested 50 different handlebars. While each model may not be unique each one does have unique characteristics. For example we may have tested the same bar in different lengths to see how length affects stiffness. We also looked at this with some rise and sweep options as well as different materials. We’ve once again brought back our favorite engineer, Jason Krantz. Jason’s a mechanical engineer whose graduate work focused on the intersection of composite materials and finite element analysis. Jason has worked for several companies in the bicycle industry and never fails to amaze us with the depth of his cycling related knowledge. He adds real value to all of the tests we perform. >Disclaimer: A lot of typing and numbers have gone into this article and we apologize in advance for any typos, but would warn that the possibility of mistakes is present. We don’t believe that there is any meaningful efficiency (speed) to be gained through a stiffer handlebar, so why test for that? Losses in efficiency are minimal but a stiff handlebar and stem can make the bike feel more responsive to rider inputs, especially out of the saddle and with suspension. For road handlebars we wrote, “We’re unconvinced of any performance benefit to a stiffer bar, but many people like the feeling one provides. What we are convinced of is that the additive effect of parts that deflect more does at some point become a problem. The point at which it becomes a problem is different for different riders and terrains.” There is clearly a line for a given rider in a given set of circumstances where too much flex becomes a problem and inhibits steering and tracking on technical terrain. It may be worth noting here that one major manufacturer declined to be included in the testing by stating that they don’t design their bars to be stiff they design them to be comfortable. 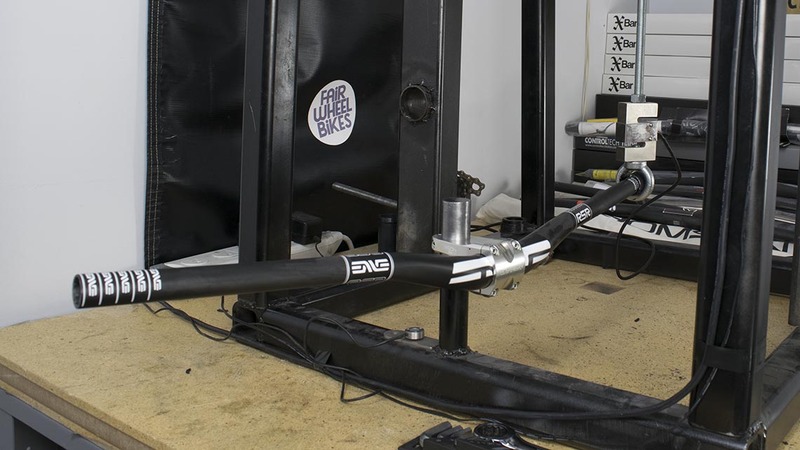 While this may be applicable with road bars, we have to politely disagree when it comes to mtb bars on front or fully suspended bikes, we feel that intentionally adding flex is not a desirable trait. If one were designing for fully rigid bikes then that would be a different matter. If you combined a very flexible, frame, steerer, stem, bar etc… into one bike you’d more than likely notice it in it’s handling. 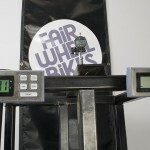 If you mounted the most rigid pieces you could find in one bike you likely would have more than adequate stiffness but at the same time perhaps some un-necessary weight gain. The ideal is some moving sweet spot in between that is different for each given set of circumstances. Hopefully through continual updates to this list and the stem tests, we can provide the information that helps riders find the sweet spot in both bar and stem that each one individually desires. Our two readouts used during testing. 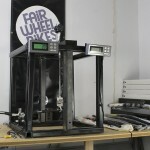 A load cell measures the force placed on the handlebar while a digital drop indicator measures deflection at that load. Each handlebar was mounted in the fixture and the testing performed 3 times and then averaged. All bars tested were loaded 1cm in from the end of the bar. Each bar was mounted with recommend torque specs and preloaded with 20 pounds of force. Once preloaded the equipment was zeroed and another 50 pounds of force was added and a measurement recorded. The measurement was taken at the point of load. Notes about the loads tested: The actual load doesn’t matter because the response of the structure is linear. That is, a handlebar that deflects 5mm under a 25-lb load will deflect 7.5 mm under a 75-lb load, 10 mm under a 100-lb load and so forth. This assumption of a linear response to loads is valid roughly until an aluminum bar bends permanently (plastic deformation) or until a carbon bar breaks (brittle failure). These bars were loaded with 50 pounds because it’s a nice round number and a fairly realistic approximation of real-world xc conditions. If a sprinting rider is pushing on the left pedal with 200 lbf (in other words, he can squat 400 lbs), he must create an equal and opposite moment (twisting force) via the handlebars. The pedal is about half as far from the frame centerline as the handlebar is, so it would take a reaction force of 100 lbs at the right-hand bar to counteract the pedaling force. This is the same as applying 50 lbf up on the one side of the bar and 50 lbf down on the other; the total moment is the same. Notes about rise and sweep: We tested and compared bars with a range of rises and sweeps. All rise and sweep numbers were provided by the manufacturers. Carbon Fiber vs. Aluminum: While carbon offers little or no weight savings when applied to stems (see our previous stem test), the lightest handlebars are usually made from laminated fiber. Handlebars are stressed primarily in bending, and 0-degree carbon fibers take these loads very, very well. When you throw in a few layers at 45 degrees to deal with torsional loads and maybe some circumferential reinforcements where the levers mount, you often end up with a bar that’s a bit lighter than the equivalent aluminum bar, but often more expensive. 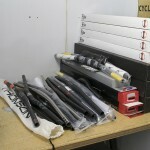 Reduced weight is a wonderful thing, but do carbon bars offer another advantage: Composite structures generally damp vibration better than metallic ones, and many riders have found real-world damping benefits when they fit a carbon handlebar, though arguably this may apply more to road than a mountain bike, especially when suspension is considered. Carbon, alloy, rise, sweep, width, shape, what matters and what doesn’t? Notes on Sweep: Sweep seems to have no measurable affect on deflection. 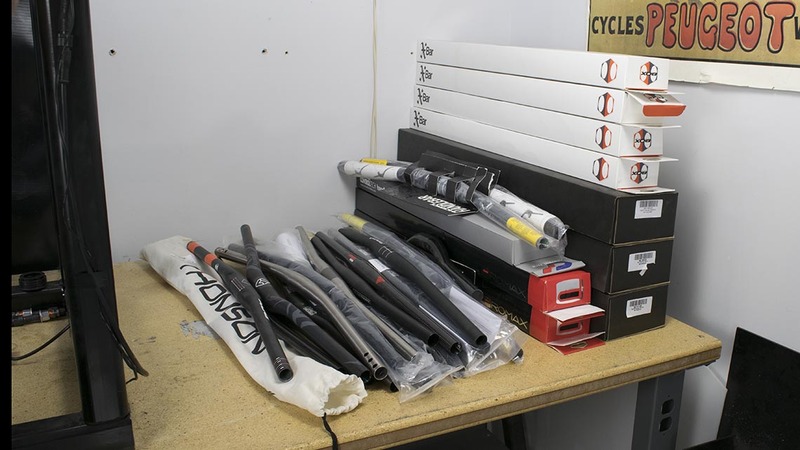 Take the Thomson Ti bars for example, we tested two flat bars one with 6 degree and one with 12 degree sweep, but both with the same length and very similar weights. The result was that both bars had near identical deflection and stiffness to weight. Notes on width: This review covers a lot of bars with different intended uses, the first segment is 50 handlebars in widths varying from 560 to 800 mm. Width seems to be one of the most critical components, not only in rider preference but also in a bars performance in this test. Longer bars have to be heavier not only due to their added length but also to reduce the deflection under load. This leads to short bars having a definite advantage in deflection testing, weight and stiffness to weight. 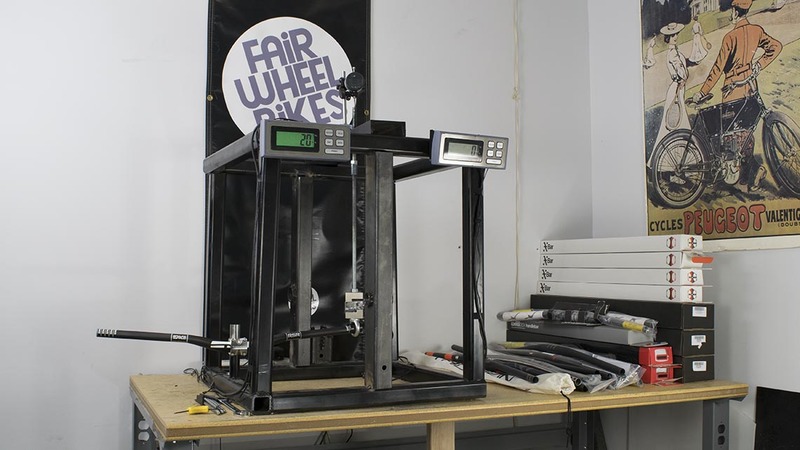 Therefore we’ve broken the test up and will compare results by groups based on 50mm increments. 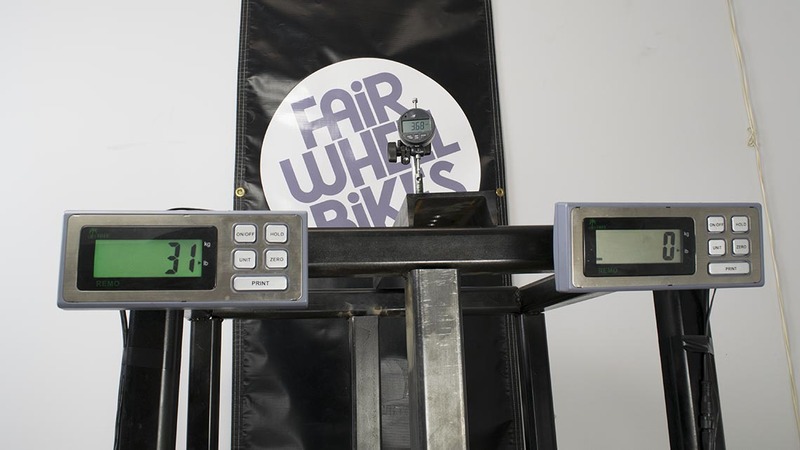 We feel this is a better way to present the results as most riders have an ideal width but can vary up or down from that a little without bother. Our load cell during testing. All bars were tested under 50lb of force to measure deflection. Bending: what matters and what doesn’t: What really matters in determining how much a handlebar bends? Length. It matters more than clamp diameter, more than material and a lot more than wall thickness. Handlebars are essentially tubular cantilevered beams, and as such, bending displacement is proportional to length cubed. That means that if you go from a 600mm bar to an 800 mm bar (150% of your original bar) you’ll see nearly 3.5 times more deflection in your new bar. In other words, you’d go from 600 mm and 5.5 mm of deflection to 800 mm and about 18.5 mm of deflection. That’s a lot! 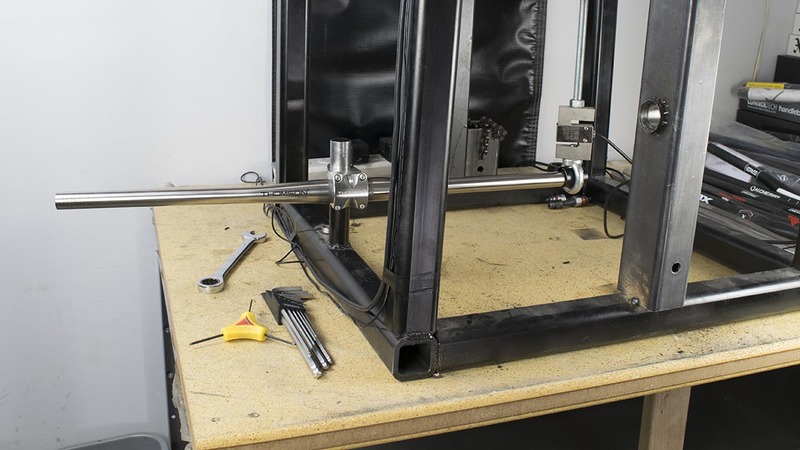 But the test results show that 800 mm bars move much less than 18.5 mm. Why is that? The 3.5x multiplier mentioned above assumes that bar diameters, wall thickness and materials are the same between the 600 and 800 mm bars. But this isn’t realistic. A given load, such as the 50-lbf load in this test, stresses a longer bar more. Torque is just force times distance; when you keep the force constant and increase the distance, you get more torque. More torque means more stress, so a longer bar needs more material to counter both increased bending and increased stress due to torque. To address these issues—and thereby to keep riders from wondering just when their bars might break on bumpy descents—manufacturers increase wall thicknesses and rearrange fiber layups to reinforce longer bars. Deflection is brought back to a reasonable range and strength increases, which is obviously a good thing. But there’s no free lunch, and weight increases. Often times a lot. The best place to see this is in the stiffness to weigh ratios. A 600 mm bar has a S:W ratio roughly six times that of an 800 mm bar. On one hand, that’s extraordinary. On the other hand, it’s exactly what Euler-Bernoulli beam bending theory predicts. Science. Stiffness vs strength: Back in the late 1980s, I bought a Syncros Shotgun handlebar that had a straight 22.2 mm (7/8”) diameter and no bend. A shim brought the 22.2 mm up to 25.4 mm where the stem clamped the bar. In other words, it was a tube. It was fairly hip in an era of Hite-Rites and the original Rock Shox RS-1. It’s hard to buy a bar these days that isn’t 31.8mm at the clamp, and now manufacturers are selling 35 mm bars. 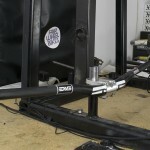 Is there a real advantage to running a 35 mm bar rather than a 31.8 mm bar? Well, maybe. A tube with a larger diameter can be both stiffer and lighter than one with a smaller diameter, since both stiffness and strength increase with the fourth power of the diameter. But there’s a catch: the center section of the bar has to deal not only with bending and shear stresses, but also “hoop” stress from the stem clamp. If you make the center section thin to take advantage of the inherently stiff cross-section, you run the risk of buckling under stem clamp pressure. A 35 mm bar will save you weight, but due to the thick center section to avoid collapse under stem clamping loads that savings can vary. 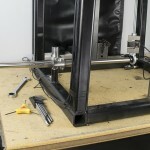 What’s more, a larger bar clamp diameter requires a larger stem, which in some cases also weighs more. If it’s stiffness you’re after, a larger bar and corresponding stem will certainly help, but only to a point. Many riders fixate on stiffness, thinking they’re losing large amounts of power and control to component flex. This turns out to be relative (see the strain energy discussion in the Fairwheel crank review). Moreover, even a stiff center section doesn’t help as much as it could.. 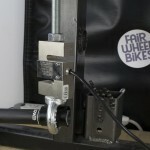 Even a beefy 35 mm bar must taper quickly to 22.2 mm in order to accommodate grips and shift/brake lever clamps. There’s a limit to how much stiffness you can gain with a large-diameter handlebar. Assuming equal wall thicknesses, a 31.8 mm handlebar center section is about 4.2 times stiffer than a 22.2 mm center section, while a 35 mm center section is about 6.2 times stiffer than a 22.2 mm center section. 31.8 gets you a lot of stiffness, 35mm even more.—more may or may not be better, each rider has to decide what works for them, but at least now you have the information to make that choice. But first, a little note: We are the first ones to admit, there is no clear winner and this has always been the case because of different requirements for every set of circumstances. So rather than give our opinion on the test results (which would be skewed toward our own biases of rider size, terrain, bike, suspension etc… ), we’ll just post the results and let you decide what works for you.